In a colorful Wurster Hall courtyard strewn with clotheslines, Ted Sexauer lifted fragments of his past from a basin of gray-green goo. The Vietnam War medic turned out to refashion his ’60s-era stateside fatigue jacket into handmade paper at a three-day workshop in late September led by the Combat Paper Project. “This is quite unique,” Sexauer said with some pride, nodding toward his 100-percent-cotton pulp. For making paper, pure-cotton fabric does a better job, he said, than more recent part-polyester military uniforms. Nearby, community college student Aaron Hinde — who joined the U.S. Army in 2000 and served in the 101st Airborne — bent over a wooden frame holding sand-colored pulp, a color suitable for fighting desert wars. Combat Paper leads workshops across the country, teaching handmade paper-making techniques to veterans and others touched by war — and creating a space for sometimes-emotional dialogue on military service and war. 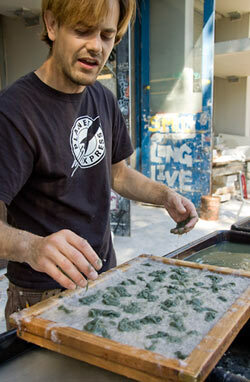 Ceramics-lab staffer and UC Berkeley alum Ehren Tool was instrumental in bringing Combat Paper to campus. At Thursday’s workshop session, he leaned over a workbench in a long apron, examining his paper-in-progress. Tool served in the 1991 Gulf War and has been making art out of his wartime experiences — in the form of ceramic cups decorated with war-related imagery — for years. Nearby, undergrads Kristin Hom and Jennifer Huang waited for a mechanical grinder to turn their rags to pulp. The two are taking a sculpture class, “Meaning in Material,” and had come to learn about papermaking techniques. Hom — who has a boyfriend in the Marines — said she found it moving to make art along with vets and their relatives and friends. Although she and her boyfriend talk on the phone every day, she said it’s not easy having a long-distance relationship with someone in the military while other students get to see their partners in person. Artworks made from participants’ “combat paper” will be exhibited at the Art Practice Department’s Worth Ryder Gallery, beginning in late October. Watch for details on the Campus Events Calendar.